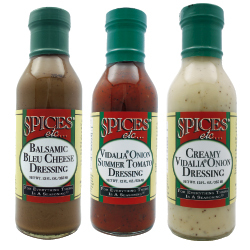 Salad Dressings | Spices Etc. New from Spices Etc. comes our soon to be best selling salad dressings. Our 6 new dressings are full of flavor and made from the finest of ingredients. They are perfect to flavor your greens, use as a delicious marinade or to dip your veggie snacks in! Enjoy one or buy all six!